I just came across an early draft of a mindmap I did back 2-3 years ago, so I thought I would share. While it was an early draft I think it is interesting to see who the main players where then and how little has changed as there are only a few small tweaks needed. As with all pieces of work in this early stage of development, I certainly would do the mindmap differently, but not much really; as I currently believe PaaS pivots 4 ways now and not 3! plus this early draft does not cover integrations/hybrid/appliances/etc..! 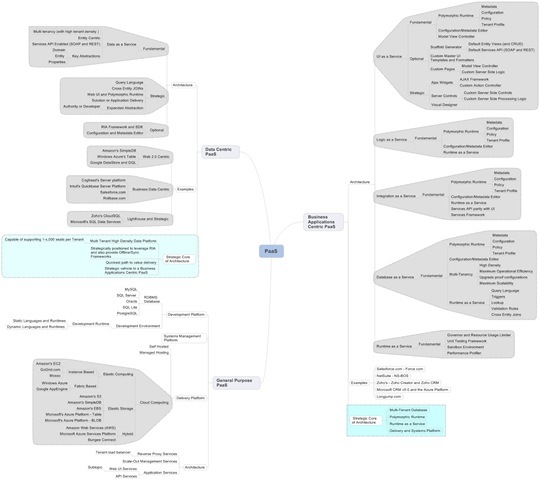 Currently I am working on a more current and expansive Mindmap on my thoughts and observations on PaaS and hopefully build on the lessons I gained from building out the full version of this mindmap posted below.